This amazing site offers lots of help for three legged dogs. A must-join for anyone who is facing osteosarcoma or amputation. If your dog’s leg is amputated, how does it affect them? Dr. D looks at amputation and life quality for dogs with osteosarcoma. My Dog Has Osteosarcoma: Should I Allow Amputation? Is amputation a good idea for dogs with osteosarcoma? Dr. Dressler looks at this decision from two perspectives. In this article: life expectancy. 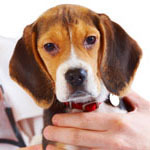 Many people as me what to look for to tell if their dogs have cancer. I thought I should give you a little summary of some of the biggies.